Medieval Garden of the Lords of Coucy. Located on an old artillery platform downwards of the ramparts, given up during 50 years, rehabilitated at the end of the 19th century, destroyed in 1917, refitted in the course of the course of tennis then again abandonned in 1945, the medieval garden sharpens all the directions... Since the release of the site by the building sites of insertion, the idea cames to create a garden located full is. Association ”A Castle For Employment” was brought to create ”Capitulary Charlemagne” schedules 11th, counting the pot, fruit-bearing and medicinal varieties imposed by Charlemagne. 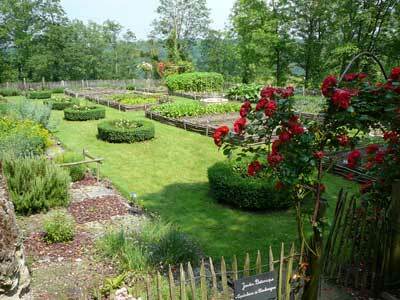 Association gaves to the garden a monastic architecture but also the aspect of a garden of peasant. You will be able to find the principal rose trees cistercians also there. from 9.00 am. to noon and from 2 pm. to 4 pm. and thursday from 9 am.to noon only. The commented visit of the garden by a disguised guide is possible for the groups on reservation near the Office of Tourism. Access by secondary road n° 1, 13 and 934.